The Pet Perio™ Test...Better Health For Your Pet Through Saliva! Gum disease, also known as periodontal disease, is the #1 diagnosed problem in animals, particularly small dogs and cats. Left untreated, it can lead to more serious diseases and ultimately be fatal. FLUIDS iQ™ can help. Through our state of the art Pet Perio™ saliva test, we analyze the causes and susceptibility to oral diseases in animals, particularly dogs and cats. What does this mean for you, both pet owner and veterinarian? Simply put, the Pet Perio™ test can improve your pet’s\patient’s oral health, overall health and even prolong their life. Coming Soon to North America…Our Revolutionary Pet Perio™ Test! The Pet Perio™ DNA saliva test is a microbiological analysis of the key bacteria implicated in oral diseases in animals. The test is purchased and administered directly by veterinarians. It is very cost effective and simple to administer. Click the appropriate link below to learn more about this new, advanced approach to assessing oral health in animals. 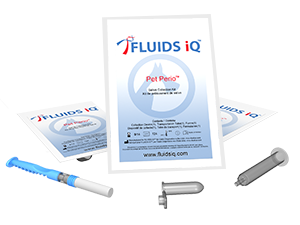 Pet Owners – Discover the benefits of the Pet Perio™ test for your dog or cat. Veterinarians – Making the Pet Perio™ test a key adjunct in caring for your patients.